For those who read my latest post and then followed the first day of action at Wimbledon, you will have noticed that two of the names mentioned previously are already out of the competition. In my defence, it’s quite a surprise that both Tomas Berdych and John Isner have been beaten by their first round opponents! So, I’m going to suggest two more potential threats to the top four’s chances and keep my fingers crossed that day two will not upset any more of the Play with Flair predictions. The 2009 US Open champion is on his way back to the top. 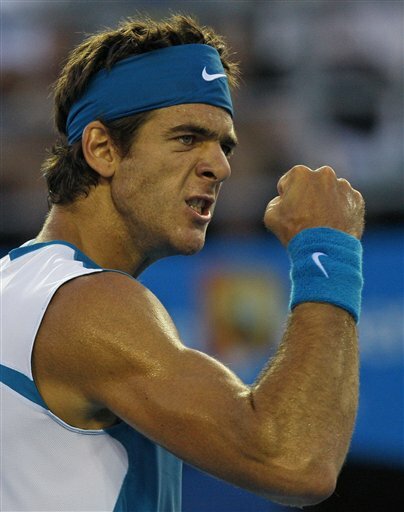 Prior to his long-term injury problems, Del Potro looked like a genuine challenger to the top quartet in men’s tennis and he will want to show the crowds at SW19 that he is still one of the best. Grass is not his favourite surface, but with his powerful groundstrokes and strong belief against the tougher opponents, the Argentine should not be ruled out of any major tournament. A player that is unique, unorthodox and unpredictable. Dolgopolov possesses a fast serve that often catches his opponent by surprise, as do many of his shots. He likes to take chances and so is a great player to watch, even if his erratic style of play can lead to his downfall. If he manages to bring together the spectacular aspects of his game and play with consistency, he could progress far into the Wimbledon draw. Alexandr Dolgopolov has the talent to challenge the stars at the top of the game. If neither Dolgopolov nor Del Potro progressed into the second week of Wimbledon 2012 it would be surprising. So, let’s hope that they perform better than Isner and Berdych managed in their first round appearances at SW19.